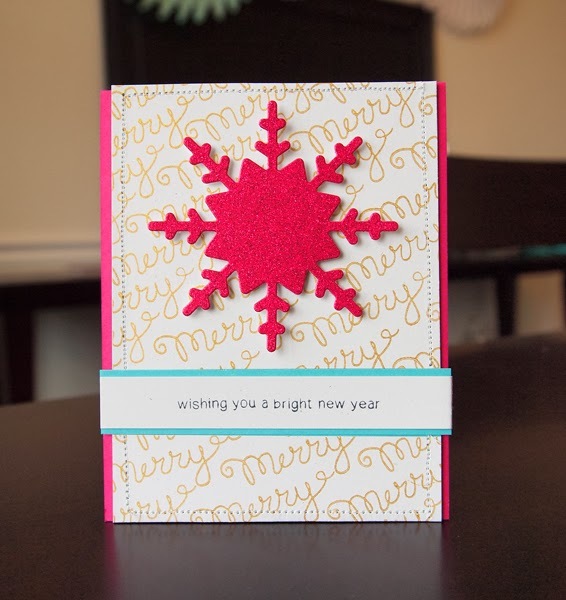 Newton's Nook Designs: Merry Card by Jocelyn Olson! 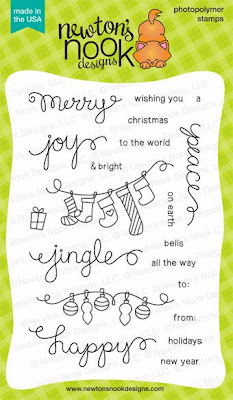 Wow - Design Team Member Jocelyn Olson is has really gotten creative with the sentiments in our new Holiday Wishes stamp set! I love how she used the "merry" in gold ink to create her own beautiful background - who needs patterned paper! Then she combined a bunch of the little words to create a sentiment that I hadn't even thought of "wishing you a bright new year" How cute is that? To read more details about this card, pop over to Jocelyn's Blog Red Balloon Cards. Here's the whole set - can you think of some other cool sentiments you can create by mixing all the words? We are just a few entries away from having 15 participants - if we do, then we will give away TWO prizes! Good Luck and tell all your friends! Jocelyn's card is wonderfully festive and fun; a delightful showcase of how versatile Holiday Wishes is! Love the stamped "merry" background! Inspiration, plus! I'm sending Newton over to Merry Monday soon with yet another card. Love that set!! yeah, this card is stunning!!! NO doubt about it!! wow!